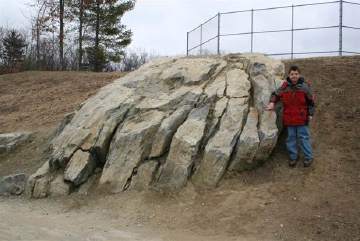 This rock outcrop at Mill Pond School shows evidence of the 370 million-year-old Bloody Bluff fault which runs through Westborough from northeast to southwest along Route 30. Named for a site in an early Revolutionary War battle in Concord, MA, this fault has long been inactive. Andy’s son Kevin, age 10 when the photo was taken, stands nearby. Three of nature’s most terrifying events – tornados, a hurricane-turned-tropical storm, and an earthquake – hit Massachusetts in 2011. Probably the mildest, but most unusual, was the “east coast earthquake” in August. Last month Andy Koenigsberg, a geologist and chairman of Westborough’s Conservation Commission, offered his perspective on the history and likelihood of New England earthquakes at a talk at the Westborough library, sponsored by the Westborough Community Land Trust. More powerful, higher magnitude earthquakes are much less frequent. On average, the Earth has an earthquake of magnitude 8 or higher about once a year, but 20 years or more can pass between such powerful earthquakes. In contrast, each year the Earth has about 1,300,000 earthquakes between 2 - 2.9 in magnitude. One clue that there are earthquakes in eastern Massachusetts comes from the local Native American word “Nashoba,” used to refer to the area around present-day Littleton, MA. The word means “hill that shakes.” Minor earthquakes are routinely detected in that area by seismometers, sensitive equipment that measures motion in the ground. The central New Hampshire area around Concord, New Hampshire., is the most seismically active area in New England, Andy reports. Historically, major regional earthquakes in New England occurred in 1638 in Concord, N. H. at magnitude 6.5 – 7; 1663 in Quebec, Canada 7-plus; 1727 in Newburyport, MA 5.6; 1755 at Cape Ann, MA 6.2; 1904 in Maine 5.9; 1940 in New Hampshire 5.5; and most recently in 2002 in nearby Plattsburgh, N.Y. 5.2. Most major earthquakes, such as those in California and the recent one in Tohoku, Japan on March 11, 2011 at magnitude 9, take place at the boundary of tectonic plates, which are large pieces of the Earth’s crust that “float” on the underlying hot, fluid-like mantle. New England is not near a plate boundary. Instead it is in an intra-plate zone – an area within a plate – that is getting squeezed by eastern movement of the Pacific plate (on the U.S. west coast) and the edge of North American plate (to the east in the mid-Atlantic Ocean), which is slowly moving west. Although this movement is very slow, about the speed at which your fingernails grow, the squeezing creates pressure that is released in minor earthquakes in our area. 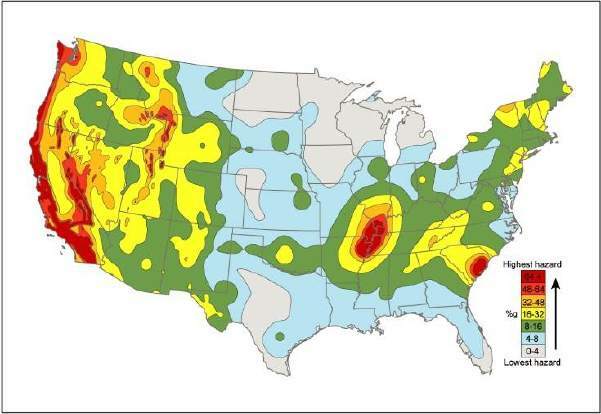 U.S. Geological Survey Earthquake Probability Map. The round yellow spot in Virginia is where the August “east coast earthquake” occurred. New Hampshire also has the same earthquake probability. On the map, the orange and red areas have the highest earthquake probabilities, and the blue and gray areas have the least. The “east coast earthquake” earlier this year, on August 23, 2011, was centered near Mineral, Virginia but was felt over a large area, including the Boston area, Maine, and parts of Canada. Its strength was 5.8, making it the strongest earthquake east of the Rocky Mountains since 1897. It occurred along a known fault zone in Virginia. People felt the east coast earthquake over a far larger area than is typical for a California earthquake of similar magnitude because of the type of rocks that underlie much of the east coast – granites, gneiss, and schists. These rocks are older and harder than those beneath California (at a plate boundary), so they transmit the energy of an earthquake much farther and do not tend to break, or fracture, as easily as the California rocks. The east coast earthquake caused no deaths, but it did cause notable damage in Washington DC. The location of our capital city, built on what was once a swamp, had something to do with the damage, and so did the type of construction in the structures that were damaged. The Washington Monument, built in 1848, suffered some damage because it is tall (555 feet) and made only of stone, without reinforcement, so it was vulnerable to damage from shaking. The National Cathedral also had damage because its spires are high and the building is an unreinforced stone structure – “basically a pile of rocks,” as Andy put it. “Earthquakes don’t kill people – buildings kill people” is an adage in the earthquake business, according to Andy. The saying underscores that the type of construction makes a big difference in the amount of death and destruction from an earthquake. A case in point was the 2010 magnitude 7 earthquake in Haiti, where nothing was built to withstand an earthquake. Thousands of deaths and widespread destruction resulted. In contrast, Andy pointed out, most structures in the area affected by the magnitude 9 earthquake in Japan survived the shaking, but the tsunami – the giant wave – caused by the earthquake was responsible for most of the death and destruction, including the problems with nuclear reactors. What kinds of construction are good or bad for withstanding earthquakes? One- or two-story wooden buildings, like the typical suburban house, tend to ride out moderate earthquakes fairly well, Andy reported. Slightly taller buildings (3 stories and above) are more susceptible to shaking, especially if they don’t have a reinforced frame or are made of brick and mortar. Interestingly, people in modern, tall office buildings, like those in downtown Boston, will often feel the swaying caused by an earthquake because even a small ground movement is amplified by the height of the building. This is one reason why people in Boston felt the Virginia earthquake of August 23 while most of us in Westborough felt nothing. How would Westborough fare in a New England earthquake? It would depend on the size of the earthquake, its location, the underlying geology, and the types of structure or construction involved, Andy said. If the Concord, N.H. 1638 temblor or the Cape Ann 1755 quake occurred again in those places, Andy thought that most homes in Westborough would be okay. Homes might lose a chimney, or a brick façade could collapse, but the house would probably not become uninhabitable. The old historic buildings near the rotary, town hall, and the nearby church steeples might fare less well. The older construction of the historic buildings would probably not hold up, he suggested. Another reason is that downtown Westborough is built on unstable, water-saturated sand, gravel, and clay, and is surrounded by swampland. Like much of New England, our immediate area has faults, such as the Bloody Bluff fault which runs through Westborough, but fortunately our local faults are no longer active. The Bloody Bluff fault is visible in a rock outcrop at the Mill Pond school parking lot. Most faults in New England are hard to see because they were buried by glacial deposits when the glaciers receded starting 18,000 years ago. Road cuts frequently are the best place to see them, such as the road cut at the Rt. 495-Route 9 Interchange. People may have the impression that there more earthquakes these days than there used to be, Andy commented, but this is not true. It only seems that way because today we have many more seismometers to detect earthquakes than we used to have, and because there are now 7 billion people on Earth so more people are living in earthquake-prone areas. Can seismologists, the scientists who study earthquakes, predict earthquakes? Again, the answer is no, but they can estimate where earthquakes are likely to occur – and that’s where earthquakes have occurred before, which is along active faults. Seismologists can also estimate the average time between earthquakes in any given locality. For example, a magnitude 6 earthquake is unlikely in New England in the near term. The last one was in 1755 at Cape Ann, MA, and such earthquakes occur here an average of every 500-1,000 years. On the other hand, earthquakes of magnitude 5 take place an average of every 60-94 years, and the last one in New England was in 1940, so Andy thinks it’s possible that we could have an earthquake of that strength in the next 25 years. But the time intervals are averages, so it could happen next year or in 2100. What is the biggest risk to Westborough from faults beneath the town? It’s not an earthquake, but radon. Radon is a radioactive gas that occurs naturally in certain rocks, such as granite, which contains very small amounts of radioactive elements like uranium. As these elements decay, the faults act as channels that allow radon to come to the surface and accumulate in basements. This is the reason why you need to test a house for radon as part of a home inspection, and why many houses have systems to remove radon before it can reach a basement. If you missed Andy’s earthquake talk at the library or would like to hear it again, look for it on Westborough TV, the public cable channel (Verizon 14 or Charter 11), in the coming months.